1 of 4 Heat broiler. Coat a broiler pan with nonstick spray. 2 of 4 Season steaks with salt and pepper. 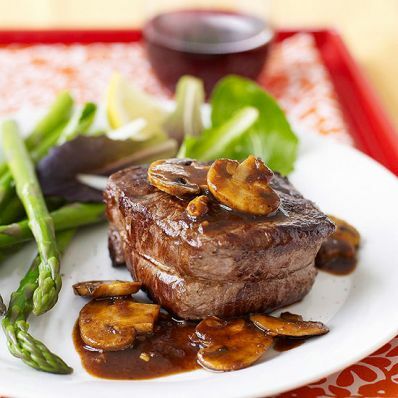 Place on prepared pan and broil for 3 to 4 minutes per side for medium rare or until internal temperature reads 130 degree F on an instant-read thermometer. Keep warm and allow to rest for 5 minutes. 3 of 4 Meanwhile, heat a large nonstick skillet over medium-high heat. Add the olive oil, mushrooms and garlic and cook, stirring occasionally, for 5 minutes. Stir in steak sauce, onion flakes, brown sugar and 1/4 cup water. Cook, stirring occasionally, for about 3 minutes, until thickened. 4 of 4 Serve with salad and asparagus, if desired. Per Serving: 14 g carb., 15 g Fat, total, 112 mg chol., 5 g sat. fat, 1 g fiber, 364 kcal cal., 43 g pro.